Happy 4th! I didn’t really have any dinner planned for today so I winged it, and came up with a pretty tasty spread, I must say. I did some recipe searches for ingredients I had on hand, along with inspiration from my new basil plant, and made a Tomato Soup with Orzo & Basil, from eatingwell.com. So simple – I sauteed onion and garlic in EVOO, added in one 10 oz. can of condensed tomato soup (leftover from when I made Polka Dot Stew and bought too much! ), water, one diced organic tomato, and 1/4 c. orzo pasta, and let the soup simmer for about 10 minutes. 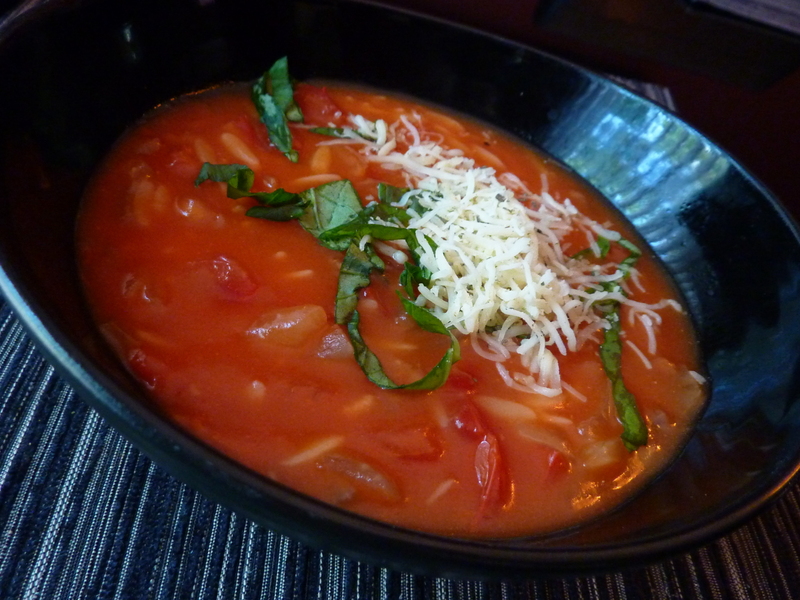 Once the orzo was cooked through, the soup was ready, and garnished with fresh basil and grated mozzarella. (Don’t ask me why I made hot soup on a 91 degree day! Better than using the oven I guess!). For the main course, I had some sliced Mini Bellas leftover from when I made pizza last week, so I tried to find a recipe into which I could incorporate them. 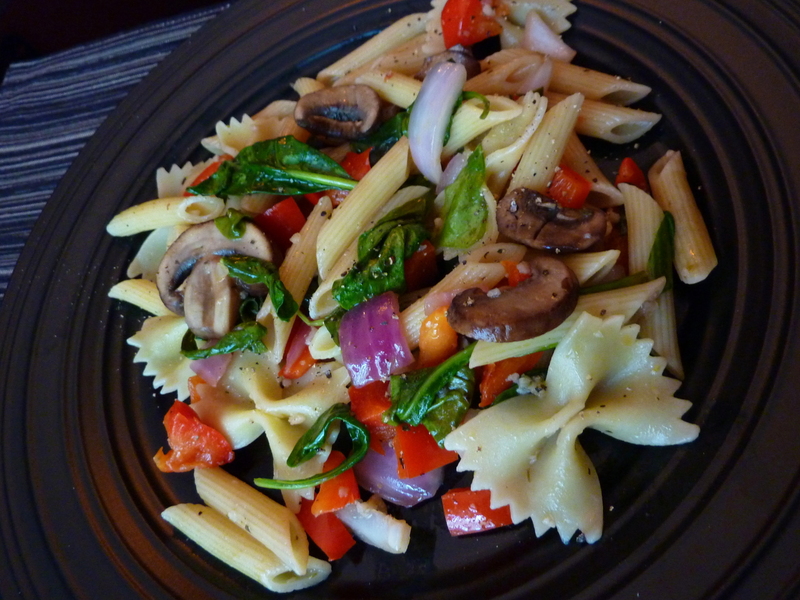 I found a recipe for Portobello Mushroom Pasta, which actually turned out great, with a few modifications, of course. I cut the original recipe in half, and used whatever pasta I had hanging out in the pantry, which ended up being a handful of bow-tie pasta, and a couple handfuls of penne pasta. While the pasta was cooking, I sauteed the sliced mini bella ‘shroomies, red bell pepper, red onion, and garlic in EVOO. Once the pasta was done I drained it and tossed it with the veggies, and added in a couple big handfuls of baby spinach, a drizzle of EVOO and about 3 Tbsp of red wine vinegar, salt, pepper, and a few sprinkles of Italian Seasoning. Delicioso! !